Ideal for operating resistive loads. Its solid-state circuitry precisely regulates the voltage and frequency of the modified sine wave output, and automatic low voltage shutdown protects your expensive batteries from excessive depletion. Suitable for a variety of power tools. Over and under voltage protection. Low voltage alarm (10.7 volts). Low voltage shutdown (10.0 volts). LED indicator confirms fault condition. 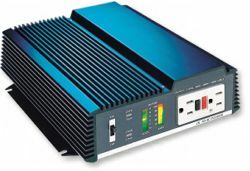 Our PROwatt Modified Sine Wave Series of inverters are an economical solution for your power needs, and are available in hardwire models ranging from 600 to 1500 watts. Powers AC products up to 600, 1000, 1500 watts. High surge capacity for starting demanding loads. Triple AC outlet (# 600). Auto shutdown prevents total battery discharge. connectors for convenient hardwire installations. Built-in display for DC volts & amps (# 1000, 1750). Supports addition of external AC outlets. Includes remote ON/OFF switch (# 1000, 1750). Modified sine wave output waveform. AC output voltage - 115 VAC RMS +/-10%. 32° F to 104° Output temperature range. Total . $159.95 . $309.95 . $459.95 . Click here for 24 volt models. . Designed to give your vehicle the best possible front end protection and give it that rugged custom look. .